An alternative to wheel conveyor as both have similar applications. It is suitable for heavy-duty products and is also used for accumulating loads. Although the cost is higher, but it is more effective in handling of the heavier items than wheel conveyor.The slope for gravity movement depends on load weight. Good for side loading and unloading. Heavy in weight and therefore not as portable. It is belt or chain driven and it has a force-sensitive transmission that can be used to disengage rollers for accumulation. It can be used for accumulating loads and merging/sorting operations. More expensive than belt conveyors. Conveyor rollers are used to carry tray, drums, boxes used in food industries like dairy, meat chocolates, pharmaceutical industries, oil industries etc. They can easily & swiftly transport the goods. 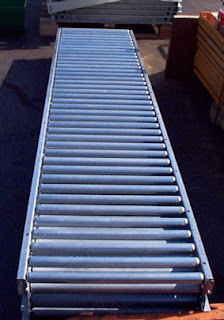 We have been thinking of getting conveyors for our business. We are producing a lot more than we used to, and a conveyor would make moving it a lot easier. Having tools like this can help us keep growing like we have been, which is always a good thing. wow really such an great and amazing blog i got allot of information from your blog thank you for sharing this. An Apron conveyor is a type of conveyor made from individual apron plates that are linked together with hinges on its underside, thus creating a looped carrying surface where materials can be placed. Apron Conveyors are used to carry materials and pieces horizontally and inclined lines. 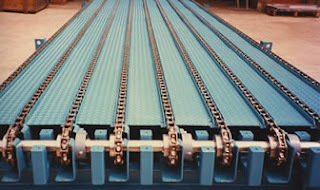 Neoconveyors.com offers Apron conveyors, which are made of pans with uneven edges to keep a check on material loss. Belt Conveyors, are specially designed to leverage the open frame and trough effect of the rubber belt to fully contain the load of materials. This type of conveyor is often used for assembly line operations, sorting, trash handling, inspection or packing operations. bulkmaterialshandling.in is the leading Belt conveyor manufacturer in India. Temasek Polytechnic students your blog is very informative. 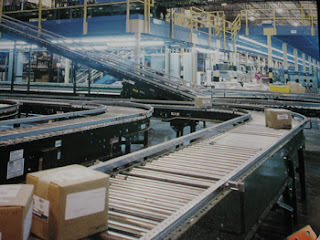 Your blogs introduced us what Conveyors are and their various types and use. I liked the way of describing conveyer's advantages and disadvantages. your blog have very nice and informative content thanks for sharing such like of information . i Like Your Blog Very Much..I see Daily Your Blog, is A Very Useful For me.